Halloween is a holiday unlike any other: trick-or-treating, jack-o'-lanterns, costume parties, scary stories, eerie yard decorations, haunted attractions, and more! Needless to say, Halloween music is just as unique, with many of the top Halloween songs containing themes that celebrate this festive, yet spooky time of year. 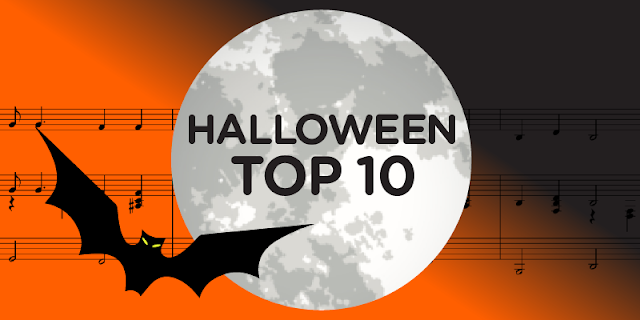 Although there are a lot of great songs that scream (pun intended) Halloween, we've done the difficult task of narrowing the list down to our top ten. What are some of your favorite Halloween songs? Let us and the rest of the Sheet Music Direct community know over on Facebook and Twitter! Featured in the 1973 rock musical The Rocky Horror Show and its 1975 film adaptation The Rocky Horror Picture Show, this song by Richard O'Brien is an ironic parody of the dance song genre. Whether you're attending a live performance or playing this at your own Halloween bash, audience participation is highly encouraged. Written and arranged by longtime Hollywood film and television composer Vic Mizzy, this TV theme song features the plucking sound of a harpsichord and finger-snaps as percussive accompaniment. Don't know how to snap? Fake it—your secret is safe with us. Released by American singer Rockwell (aka Kennedy Gordy), this track features chorus and backing vocals from former Jackson 5 members, Michael and Jermaine Jackson. This song has become a Halloween hit largely due to the popularity of its haunted-house inspired music video. Leave your silver bullets at home to enjoy this Top 40 hit from Warren Zevon and Robert "Waddy" Wachtel. Not only does this song have a catchy, yet simple piano hook that stays with you for days, but the chorus is bound to get your party guests howling along in no time. Composed by the great American jazz pianist and Peanuts composer Vince Guaraldi, this serves as the theme for the TV special, It's the Great Pumpkin, Charlie Brown. While there is nothing inherently spooky about this tune, it is the perfect piano sheet music for this time of year. From the 1984 comedy film featuring Bill Murray and Dan Aykroyd, the Ghostbusters theme song by Ray Parker, Jr. reached number one on the Billboard Hot 100 for three weeks just shortly after it was released. Parker was inspired by late-night TV to write this in the style of an ad jingle that would suit these fictional supernatural exterminators. Composed by Andrew Lloyd Webber, this song was released as a single in 1986 to promote the stage musical of the same name. Performed by Sarah Brightman and Steve Harley, this duet became a Top 10 hit in the UK and remained within the Top 100 for ten weeks straight. Featured on Danny Elfman's award-winning soundtrack for the cult-classic film The Nightmare Before Christmas, this song gets a lot of plays this time of year. Elfman is no stranger to the other curiosities of Tim Burton films either—he is also the composer behind "Beetlejuice" and "Corpse Bride." Dating all the way back to 1962, this is Halloween novelty at its best. Originally recorded by Bobby "Boris" Pickett and The Crypt-Kickers, "Monster Mash" has also been covered by an eclectic group of artists from The Beach Boys and Bruce Springsteen to The Smashing Pumpkins and Alvin and the Chipmunks. Recorded by Michael Jackson for his 1982 studio album of the same name, "Thriller" is a great song for any season, but is arguably the most thought-of title when it comes to Halloween. Not to mention, the song features one of the most iconic music videos ever made. Bonus: See our artist interpretation of this song as part of our #Lyrics2Love series. From the newest releases to award-winning bestsellers and everything in between, Sheet Music Direct provides accurate, affordable arrangements for all your favorite songs available to download and play instantly. Explore hundreds of Halloween sheet music arrangements, powered by Hal Leonard, the world's largest sheet music publisher.